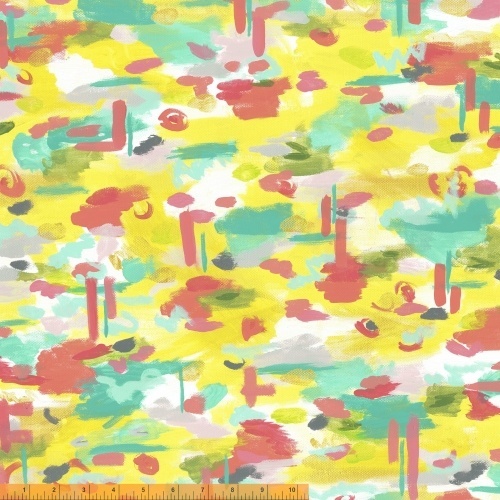 Sunshine Serenade by Melissa Ybarra of Iza Pearl Design is a bright collection inspired by Melissa's abstract paintings that emulate colors from sun-drenched tropical islands. The brilliance of the sun and water are reflected in touches of metallic gold and silver. Featuring quilting cotton and knit jersey substrates. Mix and match the jersey pieces with the cottons to make fashionable, tops, dresses and accessories. Make a quilt that will brighten even the darkest of days! 18 Total SKUs Quilting Cotton. 4 Total SKUs Cotton/Spandex jersey - Delivery to stores: January 2015.